Right now we are waiting for new Donald MCINTYRE Art to arrive at the gallery. In the meantime, here is a selection of the artist's archived art work which has featured at Red Rag Art Gallery. If you wish to register to receive updates and alerts when new art work from Donald MCINTYRE arrives select this link. Donald McIntyre was born in Yorkshire in 1923. He spent his childhood in northwest Scotland. Although McIntyre was a gifted natural draftsman and had painted from his youth he trained as a dentist. Fortunately, the dental hospital was opposite the famous Glasgow School of Art where McIntyre could attend evening art classes. Donald practised as a dentist and served in the army and taught in schools until the age of forty. In the late 1950s he left dentistry to become a full-time painter based in North Wales. However, McIntyres early experiences of the Scottish landscape and the artists he encountered in Scotland influenced him throughout his life. He always returned to coastal scenes of the British Isles, particularly those of Scotland and Wales spending most summers painting on Iona. He developed a palette and painterly approach based on the tradition of the Scottish Colourists. His subject matter was captured often with vibrant colours and a masterly skill of small and broad-brush strokes. 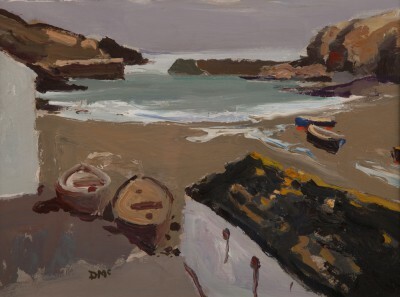 Donald McIntyre paintings are in many art collections. They were frequently exhibited at the Royal Academy, Royal Scottish Academy, Royal Society of Marine Artists and Galleries Racines, Brussels. He was a member of the Royal Cambrian Academy of Art.